Union Public Service Commission (UPSC) has released Final result of UPSC CDS I OTA 2014 Exam which was conducted for 175 vacancies of 101st Short Service Commission Course (for Men) and 12 vacancies of 15th Short Service Commission Women (Non-Technical) Course. UPSC has announced that marks of the candidates will be available within 15 days from the date of declaration of final result on Commission’s web-site for 60 days on the official website. These short listed candidate get ready for document verification stage which to be conducted for checking originality of candidates. 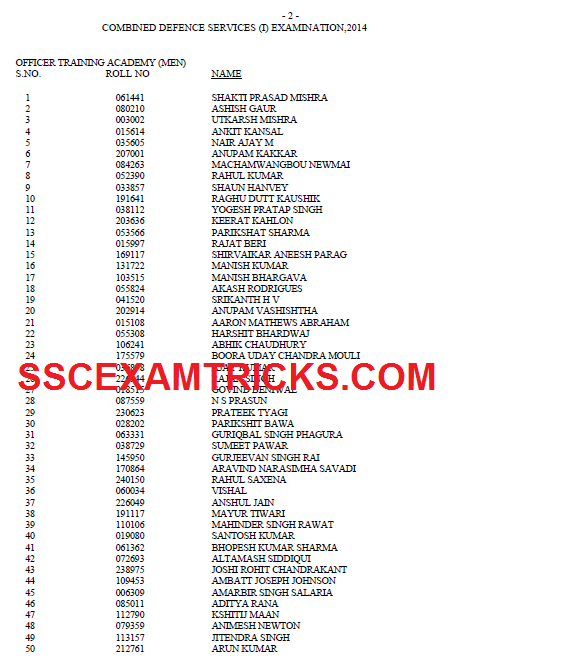 A total of 201 candidates have qualified UPSC CDS I OTA Exam 2014 and interview conducted by Services Selection Board of the Ministry of Defense for admission to the Officers Training Academy, Chennai for 101st Short Service Commission Course (for Men) and 15th Short Service Commission Women (Non-Technical) Course, which will be started in the month of April, 2015. UPSC has declared that the result of Medical Examination of candidates has not been taken into account in preparing the merit list. Those candidates who had appeared in the examination and waiting for the final result can download their final result from the direct link provided in the end of the posts. The aim of Union Public Service Commission (UPSC) CDS I OTA is to select best and suitable candidates for the various officer posts in the Indian Army. This exam is controlled by the government of India and is conducted two times i.e. June and October in every year. The selected candidates have to qualify the interview conducted by SSB after clearing the SSB and the entire medical checkup the candidates finally get selected for designation of an Indian Army Officer and join the training of the same. The selection will be done based on the performance in written examination of CDS I and intelligence in personality test of candidates. The exam was conducted on PEN MODE. Candidates were provided OMR Sheet in which candidates details and Answers were provided on this sheet. Candidates had to fill circles by Blue/Black Ball Point Pen. Answers were provided in four options in which candidate had to choose one as correct Answer. The Exam was a multiple choice question (MCQ). Four question set of Question papers A B C and D was provided to candidates in the exam. Short listed candidates of written examination were called for 2nd stage which is an Intelligence and Personality Test to be conducted by SSB. The Service Selection Board (SSB) arranged intelligence and personality test to bring out the presence/absence of Officer Like Qualities and their trainability in a candidate by IO, GTO and Psychology Test. · OBC Certificate must be in proper format & approved by authorized committee.